Shelley was born at Field Place, near Horsham, the eldest son of Sir Timothy Shelley, MP for the Duke of Norfolk's pocket borough of Shoreham-by-sea. Shelley was educated at Eton, where he was known as 'Mad Shelley', and University College Oxford, from where he was expelled for co-authoring a pamphlet entitled 'The Necessity of Atheism' and refusing to answer when asked whether he had written it. The expulsion from Oxford led to a violent quarrel with his father and was the first step in the sense of exile which pursued Shelley throughout his life. Immediately, he eloped to Scotland with Harriet Westbrook, the sixteen-year-old daughter of a coffee-house proprietor. They married in Edinburgh in 1811. During a restless and nomadic existence for the next three years, Shelley wrote ‘Queen Mab’ (1813) which reflects Shelley's revolutionary instincts and his republicanism, belief in free love, vegetarianism and atheism. It shows the influence of the writings of Mary Wollstonecraft (author of A Vindication of the Rights of Women) and of William Godwin, both of whom he soon met, along with their daughter, Mary. In 1814, as Harriet expected a second child, the marriage collapsed and Shelley eloped to France with the sixteen-year-old Mary Godwin and (surprisingly) her fifteen-year-old stepsister Claire. The three of them lived and travelled together, with only occasional interruptions, for the rest of Shelley's life. When, in 1816, Harriet drowned herself in the Serpentine, Shelley and Mary were married. ‘Ozymandias’ (1817) is the result of a sonnet-writing competition with a friend with whom he visited the British Museum just after the acquisition of fragments from the Empire of the Ramases. The sonnet expresses in harsh and dramatic words Shelley's hatred of tyranny and the human wilderness to which it leads. Much of his work expresses his fury at the effrontery, the corruption and complacency, the sneer of cold command, of those who pretend to govern. Tormented by creditors, and by a sense of exile, Shelley and his household decamped to Italy in 1818 where they remained until his death. His domestic situation was dire: his little daughter Clara had already died and now his son William died in Rome; Mary had a nervous breakdown. Yet the year from the summer of 1819 saw an extraordinary burst of major poetry. ‘Ode to the West Wind’, written in October, followed news of the Massacre of Peterloo when soldiers fired on a peaceful crowd of demonstrators, with several fatalities. Shelley was also brooding on a vicious article attacking his work and his style of life. He went for a long solitary walk by the Arno and watched the gathering of a storm against the cold, clear blue sky. The wind was hard from the West. In the poem, the wind becomes a series of shifting symbols: first a swirling chaos sweeping before it the people of the world, then a carrier of the seed of revolution to promise a brighter day. 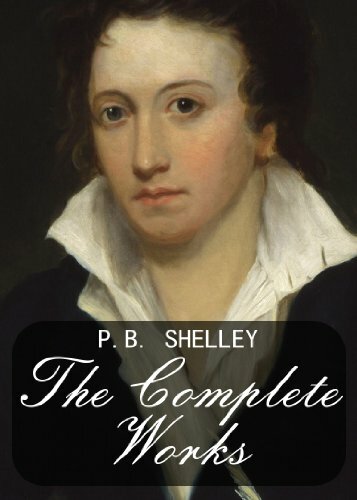 Finally the last two sections describe Shelley's own plight: the gap between what must be done and the inadequacy of his mind and body to accomplish the task. In the midst of domestic gloom, in the summer of 1820, Shelley wrote the lovely lyric, ‘To a Skylark’. It reaches longingly for the idea of escape into a world of effortless creativity. Two years later, in August 1822, while living in an isolated house on the bay of Lerici, Shelley took a sailing trip to visit Byron at Livorno. On his return, the boat was overcome by a violent summer storm and sank without lowering its sails. Shelley's body was washed ashore a week later; he was drowned a month short of his thirtieth birthday.